Chad William Forber is clearly a party animal. But his preferred way of getting down isn’t for everybody. The 41-year-old was arrested by police after they got a call that a naked man was wandering around the downtown area of Rock Island, Illinois early in the morning. 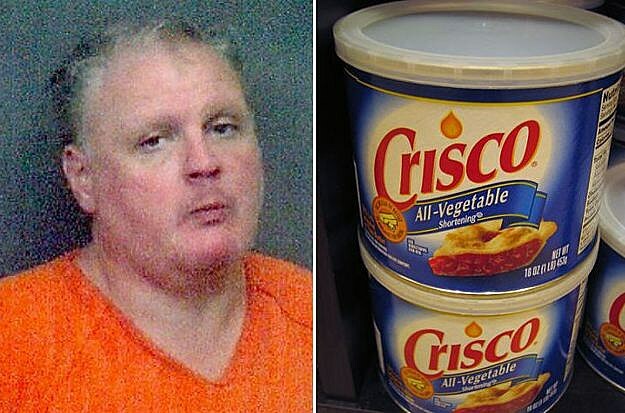 When the cops found Forber, he was covered in Crisco. While Forber wasn’t wearing his shorts, he was carrying them. And when cops searched the pockets they found a small amount of what they suspected to be methamphetamine — which goes a long way toward explaining Forber’s behavior. Forber has been charged with possession of meth, resisting or obstructing a peace officer and possession of drug paraphernalia. He is being held in the Rock Island County Jail on a $40,000 bond. What a way to kill the party.